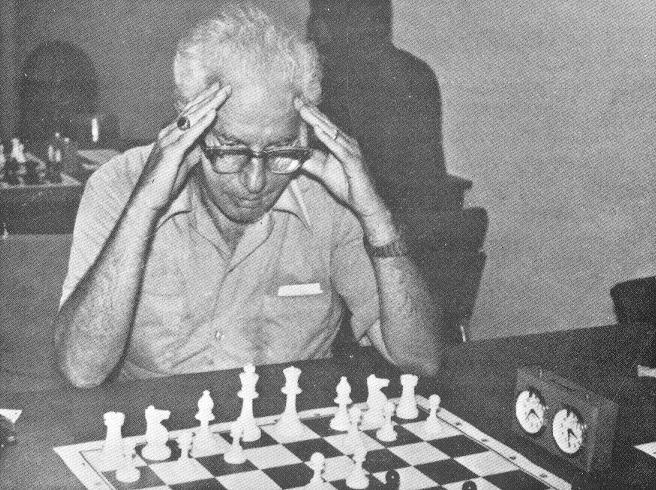 In 1992 the chess world lost an American master who, born in 1911, enjoyed a lengthy career which included games against Lasker, Capablanca, Alekhine, Rubinstein and Fischer. 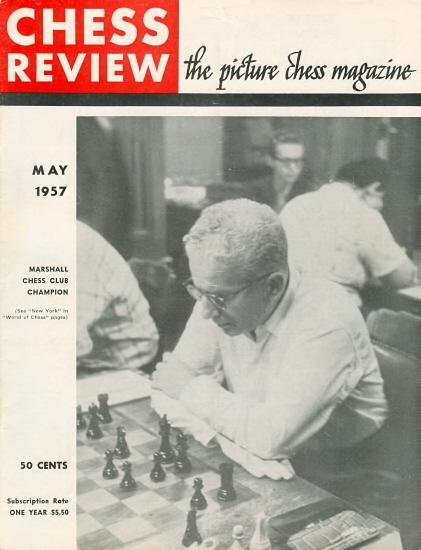 We are thinking not of Samuel Reshevsky but of a neglected figure whose obituary appeared on the same page as Reshevsky’s in the June 1992 Chess Life (page 456): Sidney N. Bernstein. His career was well chronicled in his book Combat: My 50 Years at the Chessboard (Atlantis Press, Ltd., New York, 1977), but he was an infrequent writer on the game and was deeply involved in only two other volumes. 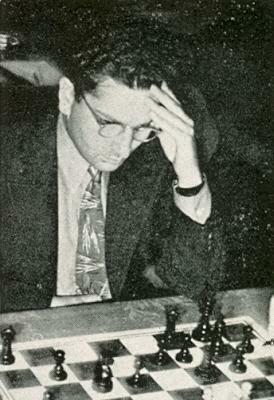 In the late 1930s he co-edited with Fred Reinfeld a book on Kemeri, 1937, and in 1947 the two collaborated on a revision of James Mason’s The Art of Chess. 1 Nf3 g6 2 c4 Bg7 3 g3 d6 4 d4 Nf6 5 Nc3 O-O 6 Bg2 Nc6 7 h3 (‘In our last encounter, I allowed 7…Bg4 and eventually lost.’) Nd7 8 b3 e5 9 Bg5 f6 10 Be3 h6 11 Qd2 Kh7 12 g4 Nb6 13 Rc1 Ne7 14 dxe5 dxe5 15 Bc5 Nd7 16 Ba3 Rf7 17 h4 c6 18 h5 g5 19 Ne4 (‘Here I must digress. No doubt I’m insane, but over many years I’ve come to feel that even the world’s greatest players (Karpov included) misplay the white side of the King’s Indian by an early e4. This blocks the fianchettoed bishop (as Black will certainly play …e5), allows a “hole” at d4 and forfeits the option of using the square e4 as a transfer spot (for example, my last move). I’ve always kept the e-pawn at home with the option of e3 if needed – and have scored numerous wins in that fashion. Incidentally, when Black has played 6…Nbd7 rather than the “Yugoslav” 6…Nc6 as in this game, I’ve been most successful with 7 Bf4.’) 19…Bf8 20 Nd6 Rg7 21 Nh2 Ng8 22 Be4+ Kh8 23 Nf1 Bxd6 24 Qxd6 Qa5+ 25 Qb4 Qb6 26 Ne3 a5 27 Qxb6 Nxb6 28 c5 Nd7 29 Nf5 Rf7 30 Rh3 Nf8 31 Rd3 Bxf5 32 Bxf5 Ne7 33 Be4 Ne6 34 Rd7 Rb8 35 Rcd1 Kg7 36 e3! Kf8 37 R7d6 Nc7 38 Rd8+ Rxd8 39 Rxd8+ Kg7 40 Rb8 Nb5 41 Bb2 Nd5 42 Bg6 Re7 (‘If 42…Rd7? 43 Bf5!’) 43 Ra8 e4 44 a3 Ndc3 45 Bxc3 Nxc3 46 Bf5 a4 47 bxa4 Re5 48 Ra7 Rxc5 49 Rxb7+ Kf8 50 Kf1 Nxa4 51 Bxe4 Rc1+ 52 Kg2 c5 53 Rh7 c4 54 Rxh6 Nc5 55 Bf5 Resigns. 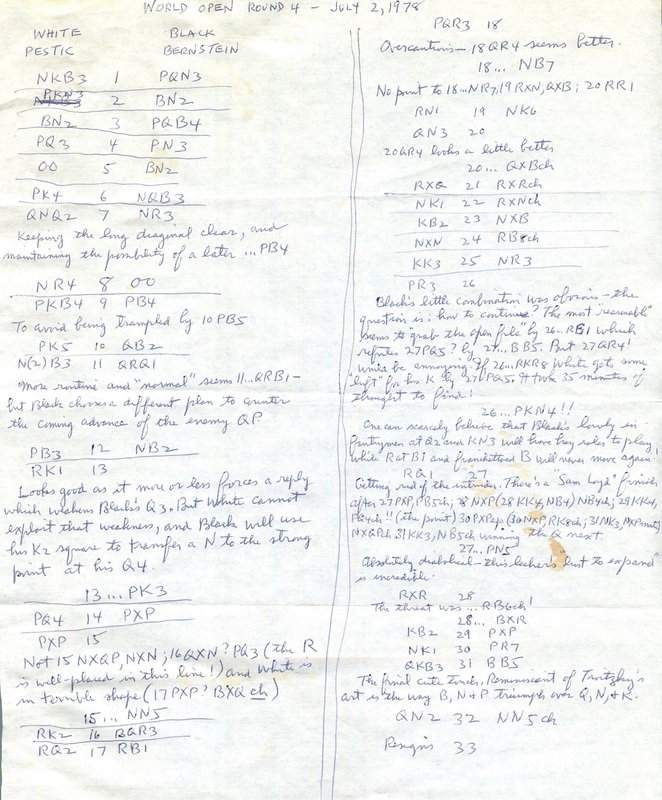 The moves of Bernstein’s draw with Capablanca eventually came to light and were published on page 243 of The Games of José Raúl Capablanca by R. Caparrós (Yorklyn, 1991), subsequently being included in databases. 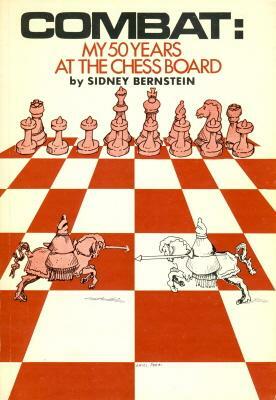 However, in view of Bernstein’s description it may be wondered whether there were additional moves beyond 37 a4. 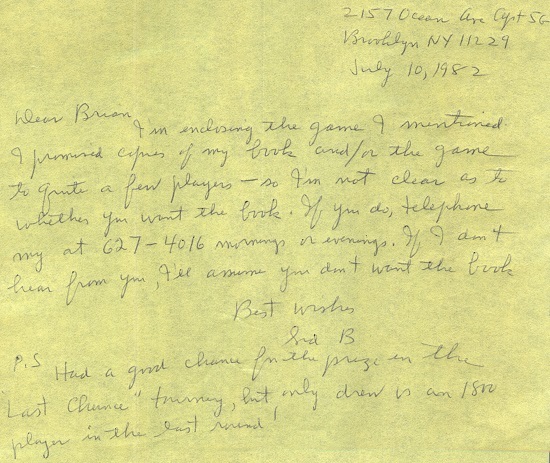 Played at the Brooklyn Chess Club on 23 April 1928, the game was given on page 265 of Akiba Rubinstein: The Later Years by J. Donaldson and N. Minev (Seattle, 1995). A score available in databases is Bernstein’s loss to Emanuel Lasker in a clock simultaneous display at the I.L. Rice Progressive Chess Club in New York on 8 November 1928. 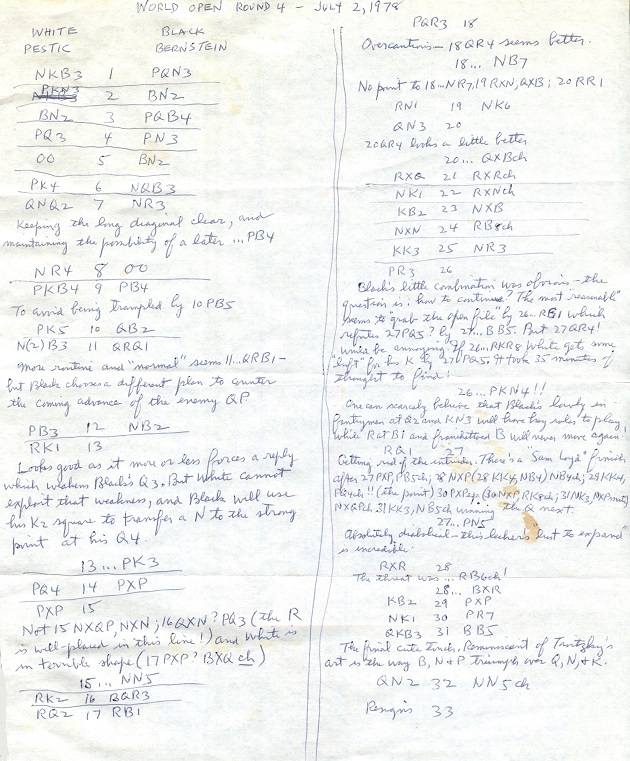 As reported on page 181 of the December 1928 American Chess Bulletin, Lasker scored +7 –2 =1. He was nearly 60, and Bernstein was 17. That game-score has not been found. ‘I met Jacob Bernstein (who had completely given up chess and was running a gambling parlor) when I was in my prime. He seemed very old to me. 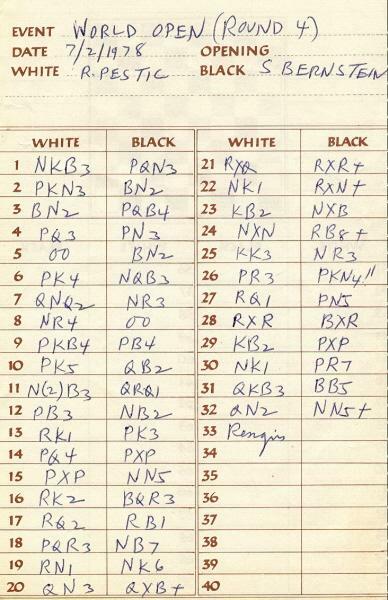 We played some offhand games (I was never much good at offhand play) and he trounced me mercilessly – I must have scored 2 or 2½ points out of 15 or 20’ (17 April 1987). ‘I don’t know the exact address of the “dive” where I met Bernstein – it was on E. 14th St in Manhattan between 4th and 3rd Aves. ... Jacob Bernstein was Jewish and probably died in 1959’ (29 April 1987). ‘The “chess club” I visited when Jacob Bernstein drubbed me was actually a gambling house. On my second visit, I played chess with the youngster Tobias Stone, who later became (and still is, no doubt) a world-renowned bridge player who achieved notoriety by accusing the famous Italian team of cheating ... Anyway, in the middle of play, the police raided the place, confiscating lots of gambling equipment and arresting everyone but us. And I remember Jacob Bernstein complaining loudly that under Mayor LaGuardia it was impossible any longer to “make a living” because the police could no longer be bribed’ (16 May 1987). 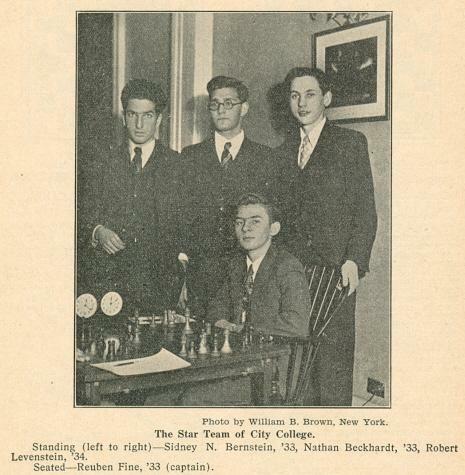 ‘I do remember that one of the famous habitués there was Abraham Kupchik (the most “neglected” and underrated player in US history – on the occasion of the Manhattan Chess Club centenary celebration a few years ago Chess Life did not mention the fact that he had won the club championship 11 times). I just learned last month from IM Walter Shipman that he (Kupchik) was most unhappy at not being chosen for the US team that journeyed to Moscow (in the 1950s). I was picked (though I did not go) and I find it interesting in retrospect that I have never given a thought to the fact that he was overlooked in my favor. He was a completely insignificant personality – at least on the surface’ (29 May 1987). On 28 November 1986 Sidney Bernstein provided information about the murder committed by Raymond Weinstein (see C.N. 1311 and pages 126-127 of Chess Explorations). As indicated on pages 183-184 of our book (from C.N. 1403), Bernstein also assisted us in trying to sort out the claim by Reuben Fine on page xviii of Lessons from My Games that ‘Bogoljubow had some of his rivals put in concentration camps by the Nazis when they arrived on the scene in Germany’. Below is an expanded account of the affair. In the November-December 1983 issue of my magazine I quoted your comment about Bogoljubow on page xviii of Lessons from My Games, “Bogoljubow had some of his rivals put in concentration camps by the Nazis when they arrived on the scene in Germany”, and asked what evidence existed for the claim and who were the victims. Although Chess Notes is read in nearly a hundred countries, nobody has been able to shed any further light on the matter, and I therefore take the liberty of writing to you direct to ask if you could kindly inform me of the source of your information. It is a delicate matter, of course, but I hope that the enclosed sheet [of testimonials] will show that my magazine can be relied upon to handle issues responsibly. Sidney Bernstein was nearly 77 when he wrote those words, but there was no vestige of elderliness in any letter he wrote us. He was a wonderful man. 1 d4 Nf6 2 c4 e5 3 dxe5 Ng4 4 e4 h5 5 Be2 Nxe5 6 f4 Ng4 7 g3 Bb4+ 8 Nc3 Qe7 9 Qc2 Nc6 10 Nf3 h4 11 gxh4 Rxh4 12 Bd2 Rh3 13 O-O-O Bxc3 14 Qxc3 Nf2 15 Qxg7 Nxh1 16 Rxh1 Qf8 17 Qg2 Rh8 18 Rg1 d6 19 Bc3 f6 20 Qg6+ Qf7 21 Bxf6 Qxg6 22 Rxg6 Kf7 23 f5 Rg8 24 Ng5+ Kf8 25 h4 Ne5 26 Bxe5 Rxg6 27 fxg6 dxe5 28 h5 Kg7 29 Nf7 Kf6 30 Nh6 Be6 31 Bg4 Bxg4 32 Nxg4+ Kg7 33 Nxe5 Rh8 34 Kc2 Rxh5 35 Nd3 Rh2+ 36 Kc3 Kxg6 37 a4 Drawn. White’s 34th move was recorded as 34 Kc2, and not 34 Kd2 (as given by Rogelio Caparrós’s books on Capablanca and, subsequently, in databases). Latest update: 24 May 2015.